Executive Summary available free of charge to BISG & ALA members. Full PDF and EPUB reports discounted 40% for both members and non-members! 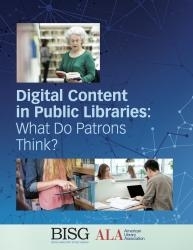 By providing valuable information on the habits of a very broad base of dedicated readers, this report can help companies throughout our industry improve their approach to doing business in the public library market and beyond. The results of this survey are available in an exhaustive, 85-page PDF report,compiled by Jim Milliot of Publishers Weekly, or as an executive summary. Purchase the full report here or the executive summary here. The way students learn and instructors teach is undergoing a radical shift, and the role of the traditional print "textbook" as the foundational tool for instruction is changing along with the traditional publishing model. To help shed light on these changes, BISG's Student Attitudes Toward Content in Higher Education survey continues to provide a baseline for tracking the rapid evolution underway in the higher education market. How do students define and seek value? What are the key factors in student buying (and non-buying) behaviors? What categories of students prefer digital learning materials? What is the current penetration and significance of textbook rental programs? How are MOOCs (Massive Open Online Courses) impacting student decisions and behaviors? Purchasable as dynamic online access via Real-Time Reporting* or as broad stand- alone PDF summary reports, Student Attitudes Toward Content in Higher Education provides practical guidance to companies working to refine their business strategies and better serve an ever-changing higher ed marketplace. Executive Summary available free of charge to BISG members. Full PDF and EPUB reports discounted 40% for both members and non-members! 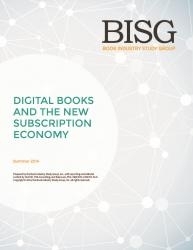 Given the success of subscription services in the film, television, and music industries, publishing stakeholders have wondered how and when these services will affect book content distribution, and a recent survey of BISG members identified subscription models as the industry's next disruptive technology. Results of this research are available in the form of an Executive Summary or full, 100-page report.